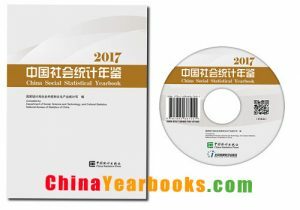 China Social Statistical Yearbook 2017 is the comprehensive statistics yearbook which reflects various aspects related to social development. It is collected main social statistical data on provinces and national total data in 2016, also main social indicators of other countries/regions in some years. Data in the Yearbook are sourced from the following departments: Supreme People’s Court, Supreme People’s Procuratorate, Ministry of Education, Ministry of Public Security, Ministry of Civil Affairs, Ministry of Justice, Ministry of Finance, Ministry of Human Resources and Social Security, Ministry of Land and Resources, Ministry of Environmental Protection, Ministry of Housing and Urban-Rural Development, Ministry of Transport, Ministry of Water Resources, Ministry of Culture, National Health and Family Planning Commission, General Administration of Press and Publication, Radio, Film and Television, General Administration of Sports, State Administration of Work Safety, State Administration of Forest, Earthquake Administration, Meteorological Administration, State Oceanic Administration, State Administration of Culture Heritage, the United Front Work Department of CPC Central Committee, State Archives Administration, All-China Federation of Trade Unions, China Disabled Persons’ Federation, Some Departments of National Bureau of StatistIcs of China, etc.